Thus begins Elizabeth Harris’s elegantly written novel Mayhem about a frankly fictional female, Evelyn Kunkle Gant, whose imagined life story suggests how women, in particular, can be reduced to oft-repeated caricatures such as “the adulterous wife,” a woman on whose account a crime was committed that “made men cross their legs.” This is the kind of story that often attached itself to “a category of able-bodied white women who ‘lived in’ and took care of invalid old people. . . Stories of wrong clung to these women . . . .” And the author, who makes herself a character in the novel at times, has grown up with them in a small rural town in Texas. Always curious in her youth about their lives, Harris feels she is “just a college degree and a few decades of change” from having been one of them. Harris’s emphasis upon the fictional nature of Evelyn’s tale might seem distancing at first, but its deeper effect is to suggest a deliberate expression of empathy on the part of the author, who makes careful choices about how to shape the story of her character. It is an empathy that powerfully draws the reader into Evelyn’s experiences and into the life of the small rural Texas community in which she lives. It pays homage to Evelyn, expresses solidarity with marginalized white women from small rural towns, performs a sophisticated act of sisterhood. The novel is also deeply about community and place. Set in rural Texas from 1909, when Evelyn is born, to the middle of the 1950s, it makes vivid the way in which country neighbors, and especially men, need each other to survive and prosper — they mend fences together, butcher cattle, and maintain communal fishing docks. Rural people, and especially women, need family, as well, for a sense of belonging. And it is the power of these needs that accounts for the way in which families and communities so easily impose traditional habits of mind and action on those who live within them. Violence, for example, which Harris’s roots historically in the settler’s early wars with Native Americans, is so deeply ingrained a tradition in this rural southern world that it seems like nature itself. 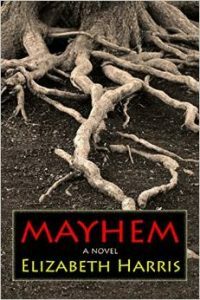 Hence the title of the novel, Mayhem, alludes not only to castration, the focus of the book’s central dramatic action, “a willful and permanent deprivation of a bodily member resulting in the impairment of a person’s fighting ability,” but also to the “needless or willful damage or violence” that is a part of everyday life for men and women both. It is mainly white men who damage, and damage each other, largely to prove they are men according to the community’s code. White men must be richer, more skilled in enacting status than other males. They must take revenge for perceived insults or threats, and, above all, they must control their women. It is not a good life for white men, who direct male coalitional violence against each other — a group of men, turned vigilantes, lynch a white man, one of their own, who is suspected of stealing. Men who are victimized can become subjects of local stories too. Such is the fate of the young man hanged from on an old oak tree, the menacing roots of which seem to appear on the novel’s cover. There are traces of racial violence here as well, largely alluded to in memories of people once enslaved, but the book is on another trail. When Les Gant, Evelyn’s husband, refuses to believe that a ne’er-do-well neighbor, Charlie, is making sexual advances to his wife, as she has claimed, when he angrily insists that Evelyn maintain his fishing lines at the pond where Charlie hangs out, he engages in an act of male bonding that is specifically aimed at discrediting Evelyn’s assertions — and the assertions of wives in general. And so, the inevitable happens. Charlie approaches Evelyn and whines to let him “put it in you.” He has a knife, so Evelyn agrees, and though Charlie fails to complete the act, Les, seeing them through the screen of the communal fishing cabin, assumes otherwise. He takes off after Charlie, ultimately slicing off one of Charlie’s testicles with Charlie’s own knife. The greater violence, however, is enacted against Evelyn — for being the “cause” of this crime. She becomes a pariah, a woman reduced to a false story, a woman who loses her place and her identity in life, except that Harris refuses to end her character’s tale there. Instead, Harris gives Evelyn a hunger to live and the strength to make a new beginning. Evelyn’s gradual and limited healing, in the life Harris has created for her, implies the possibility of partial recovery from the violence of the past and, more than that, suggests the bigger story of female compassion for, and interventions on behalf of, other women. An arresting story about an ordinary woman, about the inner life of small communities, and about the dynamics of rural southern culture — so important now in the political sphere — the quietly insightful and beautifully written Mayhem intrigues and enlightens.